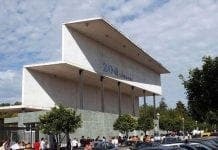 CÓRDOBA was a Roman colony, an Islamic capital and a cultural crossroads where Christian, Jewish and Moorish influences mixed. 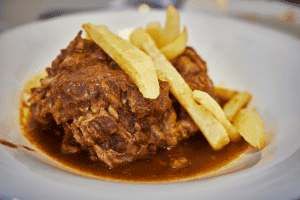 From Roman olive oil to the sweet and sour flavours of Arabic dishes, the increased use of meat introduced by the Christians and the desserts influenced by Jewish cooking, each ingredient has contributed to Córdoba’s rich culinary repertoire. The Olive Press sampled four Cordobes classics at two amazing restaurants to compare results. This comfortable bar in Plaza del Potra was the perfect place to taste these four Cordoban classics. With a voucher, customers can get a free tapa with their drink! 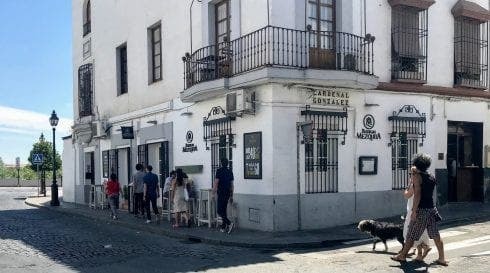 Right next to River Guadalquivir, the Roman Bridge and the Jewish Quarter, this restaurant is highly rated on TripAdvisor and for good reason. All four dishes were excellent. It’s a cold tomato cream soup made with olive oil and bread, and topped with hard boiled egg and diced serrano ham. 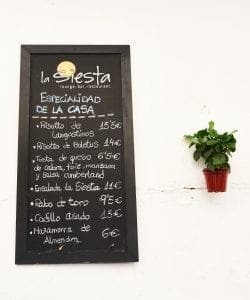 Similar to gazpacho but thickened with more breadcrumbs, it takes its cue from Roman puls, a kind-of grain pottage, and almorí sauce made during the time when Cordoba was the capital of Al-Andalus. Tomatoes arrived on the Iberian Peninsula from the New World in the 18th century thanks to Christopher Columbus, giving rise to this popular dish. 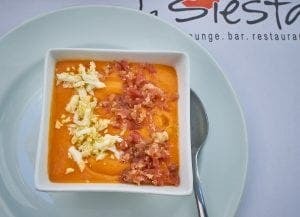 With my tinto de verano, I received a beautiful tapa of salmorejo. The thick soup was a perfect mix of olive oil and tomato flavours, and the egg and serrano ham on top provided a chewy, savoury respite. The cold tapa was incredibly refreshing under the hot afternoon sun. Eaten with La Siesta’s bread, it was absolutely unbeatable. 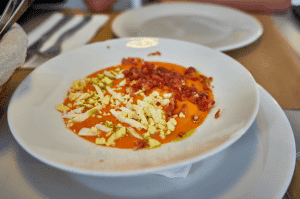 I ordered a tapa-sized portion of salmorejo emulsified with olive oil, Iberian ham and egg. The flavour of olive oil was much more pronounced than the tomato – it almost tasted like an olive oil soup. It was extremely creamy and a bit heavy to eat, with the consistency of a dip. Regardless, it was still delicious. After eating these, fried eggplant will become my healthy replacement for fries and even sweet potato fries. 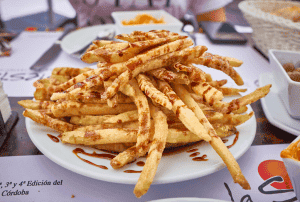 The dish has Arabic origins and is typically served with miel de caña (sugar cane honey). They can be served in strips or round chips. I ordered a half ration and was impressed by the plate of golden fries brought out. They looked like normal chips but after just one taste it went straight to the top of my list of fried finger foods. 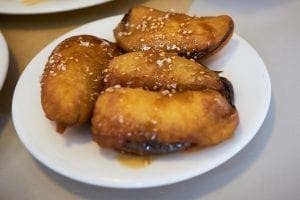 Crisp but not too oily or heavy, the flavours of eggplant and honey shone through. The dish was mostly eggplant and not like those cheap cardboard fries that are 95% fried batter and 5% food. Though I could have done with a little less honey, this dish was finished in a flash. These tapas-size caliph aubergines, fried in olive oil and finished with Pedro-Ximenez reduction and sesame sauce were an interesting twist on the classic. Instead of looking like fries, these were fried whole eggplants. While the outer shell was definitely more greasy than the dish from La Siesta, the contrasting sweet sauce was delectable. The berenjenas almost tasted like an Asian fusion dish with the sesame sauce, and definitely had me dipping for more at each bite. 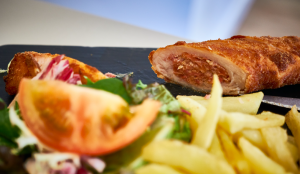 Flamenquín is serrano ham rolled in pork loin, breaded and fried, often served with fries and mayonnaise. It can also be made with boiled ham instead of pork loin, or have a variety of other fillings like fish, cheese, and chicken. According to the University of Cordoba, flamenquín was created in Bujalance, Córdoba in the Middle Ages. Its name means ‘little Flemish’ because its golden colour was likened to the blonde hair of Emperor Charles V’s Flemish courtiers. An alternate meaning is much simpler: the roll resembles the neck of a flamingo. This flamenquín may have been one of the best things I’ve ever tasted. Moving beyond how aesthetic it looks when cut, the meat was tasty and cooked to perfection, going well with the light mayonnaise. The perfect flamenquín, hands down. This was a ration-sized flamenquin with chips on the side. The generous portion of crumbled Iberian ham in the centre made it much easier to taste, bringing out the characteristic flavour, making the roll more flavourful and filling. But the pork was too dry and tough to chew, and the outside was less crispy compared to La Siesta’s flamenquín. 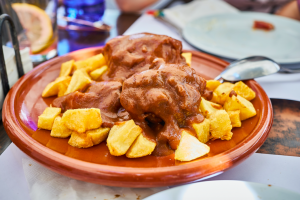 This dish was allegedly invented in 16th century Córdoba to use up every bit of the slaughtered animal after a bullfight. Now it is more usually made out of oxtail or cow tail. Some versions even include chocolate in the sauce. The oxtail was truly cooked to perfection—the meat slid off the bone and had that melting texture you only get from slow-cooked meat. However, the sauce’s tomato flavour was extremely overpowering, giving the meat an almost too-sour taste. Something about this half-ration sized dish of oxtail stewed with vegetables and local wine tasted like home. The meat was tender, with the flavour of the sauce soaking into every bite, and the hint of tomato tartness added extra kick. This comforting dish just screamed ‘homemade’.